It's getting a little confusing these days. When we first started mushrooming more than 30 years ago, it seemed as if the gold-toned chanterelles were always referred to as Golden Chanterelles. 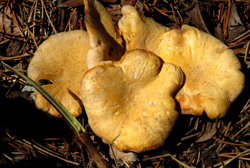 Now, the list of gold-toned chanterelles includes Cantharellus formosus (Pacific Golden Chanterelle), Cantharellus cascadensis (a giant, oak-loving chanterelle), Cantharellus cibarius var. roseocanus (Rainbow Chanterelle), and perhaps tomorrow will bring us yet another chanterelle name. The bottom line is, however, that a chanterelle by any name is just as sweet. We started thinking about the variety of golden-toned chanterelles the other day when we received an e-mail broadcast from the Oregon Mycological Society. Scrolling down the photographs of the 25 mushroom specimens that had been displayed and identified at the 8/26/13 OMS meeting, we were mesmerized by No. 21, Cantharellus cibarius var. roseocanus, sometimes referred to as the Rainbow Chanterelle. Hum, according to the OMS e-mail, it grows under Sitka spruce, Engelmann spruce, and shore pines (also known as beach pines). Steven and I looked at each other, grabbed our mushroom baskets and headed out to a nearby spot where shore pines line the sand dunes and a drippy fog is not unexpected in the late summer months. After following the well-worn trail through the pines for about 15 minutes and cursing the proliferation of gorse on both sides of us, we soon tired of the uninviting landscape and headed back to the car. Then it happened. As we approached our vehicle, we spotted the first of the Rainbow Chanterelles, snuggled close to the base of a shore pine. Then, we discovered even more, hiding under the fruiting salal next to the car. As Steven photographed mushrooms, I circled the area and returned with a basket displaying a number of remarkable specimens. What a treat to so easily encounter these choice Rainbows! Celebrating the First White Chanterelles of 2013! We're celebrating! Our foray yesterday rewarded us with a basket chockfull of the first white chanterelles of the year. What a treat! 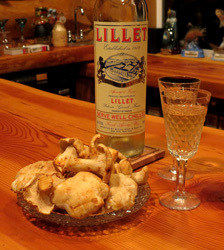 We're celebrating the first white chanterelles of the year. We've never stopped thinking about Hildegard Hendrickson, an old and dear friend from back in the days when we called Seattle home and were actively involved in the Puget Sound Mycological Society. She was such a tremendous resource, patient and eager to help even the most inexperienced of mushroom hunters such as we were when we first encountered her at the identification table. Her years of experience and her expertise were invaluable. She's the one who taught Steven and me how to talk to each other in the woods using the whistle/compass combination that we continue to faithfully wear around our necks each time we go foraging in the woods. Our code is simple: 1 blast means "Where are you? ", 2 blasts means "Let's go", and 3 blasts means "Come here - I've found something interesting!". Sadly, Hildegard disappeared while on a day hike in search of morels in a mountainous area northeast of Lake Wenatchee area in early June. Even though many, many individuals searched tirelessly for her, Hildegard was never seen again. In memoriam to this dear and dedicated mushroomer, we offer this month's recipe, Pork Scaloppine with a Morel Marsala Sauce. Here's to you Hildegard, and thanks for being such an inspiration for all of us over these many years. You'll always have a very special place in our hearts!